At Stella Maris Beads we’ve encountered rosaries in every condition imaginable. 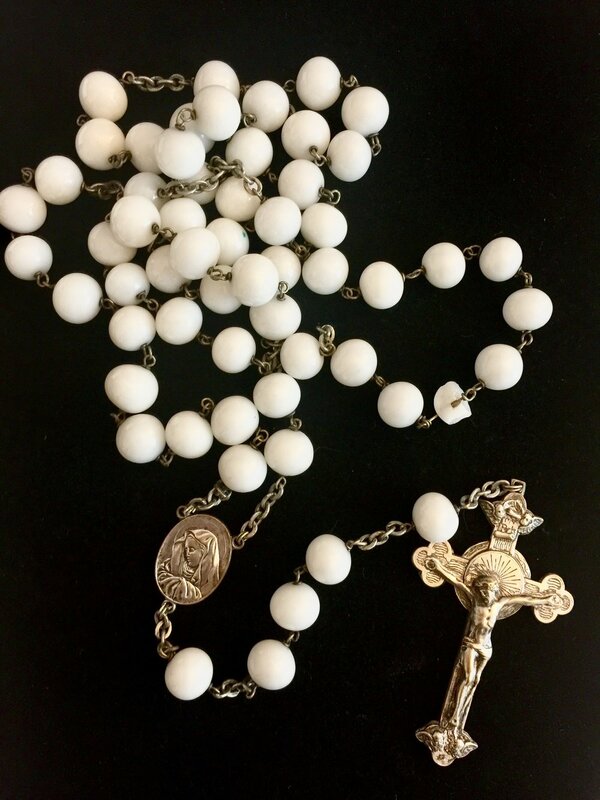 Our parts inventory includes not only different types of metal findings, beads, crucifixes, and centerpieces but vintage rosary parts as well. 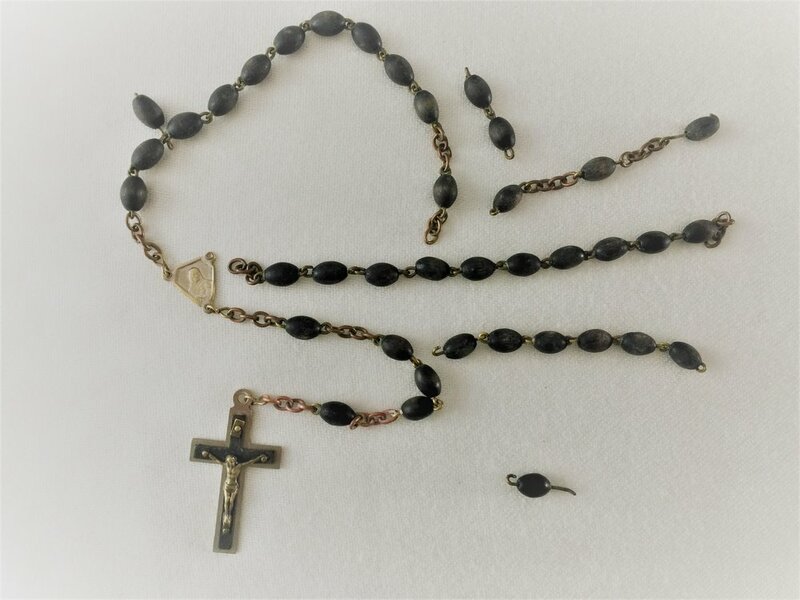 Vintage rosary restorations are our specialty and we attempt to restore a vintage rosary to its original condition as much as possible. To request a repair, complete the Rosary Repair Request form. Some rosaries come to us in pieces, such as the one pictured. While the repair looks complex, in fact, this is one of the easier repairs because it’s a matter of repinning the beads and joining the links together. Some rosaries come to us with a broken or missing bead. This type of repair is simple as long as a the replacement bead or beads can be found. We keep an inventory of vintage beads. Keep in mind, though, some beads are rare and replacements can be difficult to find. Many rosaries are made with pins that are silver plated and the underlying metal begins to show through as the silver wears through use and age. In most cases when I’m restoring a vintage rosary I’ve purchased, I will not re-pin it. However, once in a while I find one where replacing the pins can enhance the look of the rosary. Such is the case in the rosary pictured here. The right decade is the newly pinned beads while the left is the original. You can see how the new pins highlight the beauty of the original beads. I found this beautiful wood bead vintage rosary online. As you can see, not only is it broken but the corpus is missing from the crucifix. It so happened I had a replacement crucifix from a lot of vintage rosary parts I had purchased and I was able to replace and repair most of the rosary. It is missing one bead and due to the size (it’s much larger than what it seems in the picture) it has been difficult to find a replacement but I’m still looking. I’m offering this repair up to St. Anthony!